The end of an era. Blog post here. please disable adblock while browsing this site. Hey guys. Remember me? It’s been a while. It’s also been a while since ol’ Business Cat’s last book, so it’s time to do something about that. I’m happy to finally be announcing a release date for volume two, ‘Business Cat: Hostile Takeovers’, coming to book stores near you on May 7, 2019. This book will collect the entire last half of the Business Cat series, picking up right where book one left off. It will also include never-before-seen comics and other bonus materialy good bits. What’s more is that it’s available for pre-order right now! Why wait a few months to throw your hard-earned money at this title when you can do so immediately? In all seriousness though, I hope that you guys will enjoy the book and that it makes a worthy successor to the first. Thanks to all of you again for your continued support and for helping to make this possible! Four years ago I uploaded the first Business Cat strip and was awoken in the dead of the night to find my phone going crazy with an endless stream of notifications. The post had gone viral and was finding it’s way to seemingly every nook and cranny of the internet. I had never intended it to be anything more than a simple one-off gag, but with the bevy of such positive responses flooding in, I began to realise that I had ideas for another one. And another one. Until eventually I find myself here realising I’ve been doing ‘another one’ every week now for four years. In that time the comic has grown to help support me financially and even made me a published artist/author – something I never thought I’d be able to say about myself – with a second book on the way. 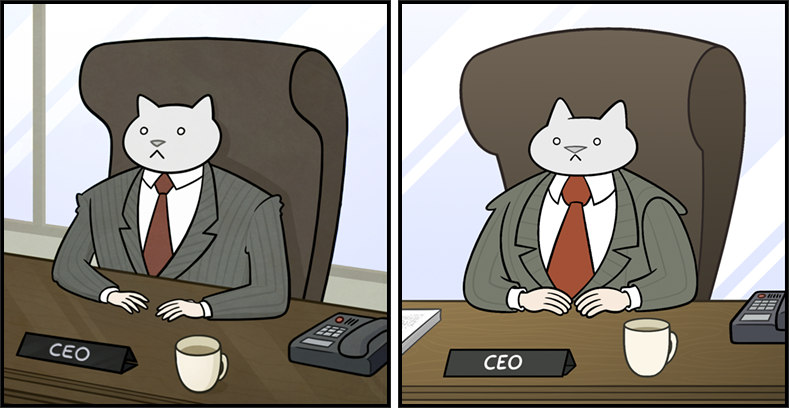 But all good things must eventually come to pass (boy, am I learning that the hard way these days) and so too must it be with Business Cat. I had been toying with the idea of ending the series for a while now, as I was beginning to feel there wasn’t enough new ground left to cover, and I’d rather end the series while I can still be proud of it than run the premise into the ground. From as early as the IRS investigation storyline I knew where this story arc was headed, and I have to say that I really enjoyed taking the series in new and unexpected directions for the readers. It was a decision that certainly divided a few opinions, but at the end of the day I’m happy with the results and I can only hope that most of you were too. I had written these last few strips to serve as a series finale, if need be, but with room to go forward in case I decided continue. Up until as early as last week I wasn’t quite sure which it would be. But I can say with certainty now, for the foreseeable future, this is in fact the end. I don’t often put much of myself out there for you all to read, but the last five or so months have been hell. Between the diagnosis of a cancerous tumor in my cat’s mouth (don’t worry, a few stressful operations later, he’s now fine), and the extremely sudden/unexpected ending of an eleven year relationship, a lifetime’s worth of living with depression has finally caught up with me and I’m now having to confront that. I’m not sure what I’ll do next. It’s been a very real struggle to stay creative, and at this point, I’m just looking forward to some time away from it all for a while. But I just want to thank each and every one of you for being along for this ride with me, and for making the last four years possible. This comic would be nothing if not for all of you reading and sharing it, and it’s been incredible to see such positivity surrounding my work. Finally, I’d like to encourage you all to keep following on the social media outlet of your choice if you’d like to keep up to date on the status of the upcoming book Business Cat: Hostile Takeovers (release date pending), and if you ever want to be made aware of any of my future projects, be they the return of Business Cat or otherwise. For my Patreon subscribers, don’t worry, you won’t have to do anything, I will be deactivating my account for the time being and will give plenty of fair warning before it becomes active again (if ever). In the meantime, I will be filling out the remainder of the month with some never-before-seen extras and maybe another prize raffle or two. It’s been fun guys. Until next we meet. The holidays are right around the corner guys, so that means it’s time for me to start peddling my wares. Good news for you is, I’ve got something pretty damn cool to peddle: Business Cat pins! These hard enamel pins are 2 x 3cm and look great on just about anything you can poke a hole through. Unlike most items in my store, I’ll be shipping these ones out myself so I have a limited supply and all Christmas orders must be in before December 10 (December 15 for UK peeps). If you’re interested, don’t miss out! Additionally, I will be giving out five free pins to randomly selected Patreon subscribers (2x $5 / 3x $10 a month patrons) on November 20. So if you’ve ever considered becoming a patron, there’s no better time to start. I also have a new mug on sale featuring the cast of Business Cat: Ted, Janet, Rob, Steve, and ol’ BC himself. It’s great for keeping beverages in – be they hot, cold or somewhere in between. As a matter of fact, all the mugs in my store are great for this, so be sure to check them out if you’re in the business of beverage keeping. Finally, I’d also like to remind everyone heading into this brave new year about the Business Cat 2018 Calendar. You can use it like you would a regular calendar, except this one has my comics on it. So there it is. That’s my reminder.